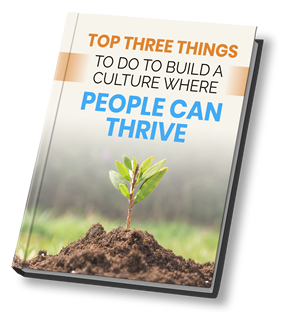 Creating a culture where people can thrive. One of my teachers, the late W. Edwards Deming, shared some of his profound knowledge with me when he said, “Organizations don’t change, people do.” In other words, if people don’t change the way they think and behave, nothing will change. I have seen so many organizations attempt to change business models, organizational structures, strategies, culture, and many other aspects of their business, only to fail because they did not engage the spirit and minds of the people necessary to make the changes happen. I’ll bet you have seen similar examples. In the last 25 years, I have partnered with leaders in 39 organizations to revitalize cultures and set up the conditions for successful change. I do not have a “one-size-fits-all” program, but I do use a structure, my Transformation Framework, to guide the process as we design change together. The crucial starting point for any organizational change is at the top of the organization, with senior leadership. It is essential that senior leaders have a commitment to self-examination and are willing to be vulnerable, transparent, and courageous in becoming self-aware and sharing their awareness and developmental process with the entire organization. What senior leaders think, say, and do has an exponential impact on the organization. My transformation process utilizes feedback instruments designed to help people appreciate their strengths and limitations. The feedback helps people understand the underlying beliefs and assumptions that lead to limiting behavior, which enables them to work on their limitations at the point of origin, where real improvement is possible. Coaching is a critical part of the transformation process, and we do this in both one-on-one and group settings. Typically, clients form small teams that meet monthly to support each other in a developmental process, and the feedback instruments offer a way of measuring progress over time. As people get into their development, various needs for capability-building training arises, and these are brought in as-needed, at the appropriate time. Research suggests that 86% of employees do not know the strategic direction of their organization. So, frequently my process involves organization-wide engagement in crafting foundational principles (mission, vision, values) and strategy. The impact of involvement by employees and stakeholders in a robust and rigorous planning process is compelling. Every individual knows where to focus because the principles and strategies are in their bones! While the developmental work mentioned above is taking place, we are simultaneously developing the capabilities to continue the cultivation of an inspiring culture within your organization. Your people will learn how to make sure your culture remains vibrant without my help. My goal is to develop your independence, not dependence on me. Debi Wood Branch Manager, Paychex, Inc. I met Andrew Bennett 23 years ago at Sun Microsystems. At that time, the leadership of Sun's support organization, SunService, had embarked on a large initiative, which challenged many people's existing (and limiting) paradigms about how to define and fulfill their job role. SunService needed enlightened guidance. Andrew helped SunService navigate that change in very positive and fruitful ways. Andrew has had an immensely positive impact on not only SunService, but my own career. I am very grateful to Andrew Bennett for his contributions to business and humanity.